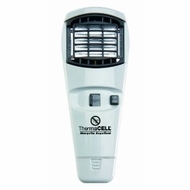 Stay mosquito free with ThermaCELL Grey Appliance. ThermaCELL provides a 15 x 15 ?Bug-Free-Zone?, enough to clear out the average tree stand or boat so you can sit in peace, perfect for hunting, fishing, camping, barbeques, backyards, decks and many other outdoor activities. An effective alternative to smelly lotions and sprays which must be applied to the skin. Repels up to 98% of mosquitoes. Also repels black flies, no-see ums and sand flies.